You’d almost think I’d grown weary of this project given how slowly I’ve returned to it after my time away, but that’s not it at all. I continue to love the idea but sometimes it just becomes hard to get there. While unemployed, my weekends weren’t a break from my labours – I could just as easily search for jobs at the weekend as any other time. Even if I wasn’t looking for work at the weekends I felt the pressure that, perhaps, I could be, I should be. While unemployed, I was also more conscientious of spending money and felt that if I stayed close to home I’d spend less than if I went to the beach. That may not be true, but that’s how I felt. So, I’ve been meaning to get to Long Reef for weeks but now that I am again professionally employed in a 9-5, Monday to Friday kind of way – it’s finally time. It’s Easter Sunday and a cracker of a day: blue sky, light breeze, hot for April but not scorching. Australians being Australians are flocking to their chosen places of worship: the beach, the footy grounds, and other places of recreation and beer. I’m heading for the Manly Ferry – such a perfect day for it. 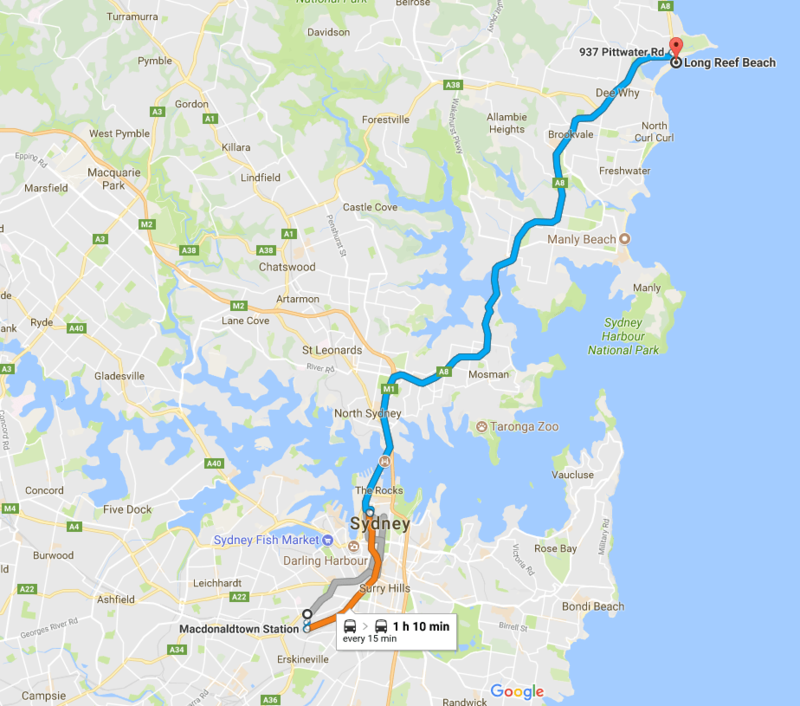 I walk through the picnickers and off-leash dogs in Hollis Park on my way to Macdonaldtown Station where I join a trainload of Sydney’s diversity for the ride into the city. At Circular Quay, I make my way through the throngs to Wharf 3 – where I find there are enough passengers queued to fill a ferry and a half. I guess I’ll take the bus. From Wynyard Station I get a limited-stops bus which drops me at Collaroy Beach in about 40 minutes, from there I catch a local bus back two stops and pop into Outpost Espresso for a pick-me up. It’s nearly 2 pm, and closing time, the only other customers are a salty, sandy, end-of-summer bronzed family of five getting milk shakes and iced lattes. I find myself in a state of joyful liberation because I am employed and it is Sunday and there’s nothing I must do. I have employment and pay coming around the corner – so, no worries. With this feeling of lightness, I set off for the walk past the golf club and Fisherman’s Beach (No 27 – visited in April 2013). Around Long Reef Point the footpath is crowded with families and couples. A paraglider is circling on the breeze, casting the occasional shocking shadow – like a giant raptor looking for prey. The sea is an autumn steel blue and crashing into the rocks below. I turn the corner and eye Long Reef Beach from its tucked-in northern end sweeping south and melding into Dee Why Beach (No 21 – visited February 2012). 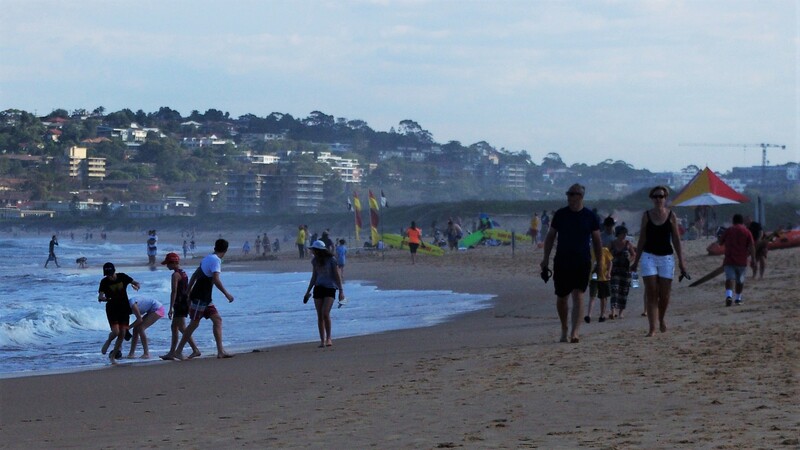 I walk up the beach to the flagged area, plant myself near the Surf Lifesavers marquee and survey my fellow beach-goers. They are mostly white, mostly local – I’m guessing. There are a lot of families, a few clusters of teenagers, a smattering of couples. 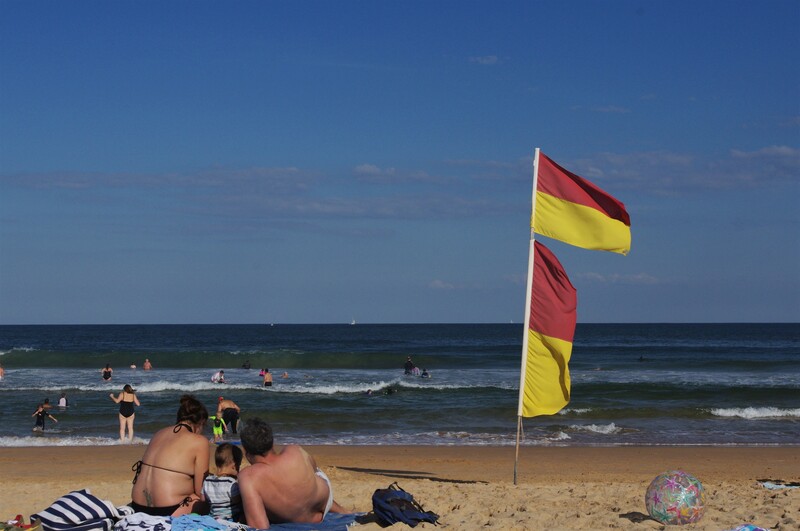 A toddler with caramel skin, curly locks and nothing but her Manly Sea Eagles bottoms on – dashes, laughing, away from her Surf Lifesaver father, who is trying to wrap her in a towel. The sea is a bit dumpy and the flags are planted narrowly together so it is through a crowd I wade into the surf. The water is cool but I grow used to it, dunking my whole self beneath a folding wave and I’m happy to bob in the power of the ocean for a wee bit while dodging little kids on boogie boards and full-grown men body surfing into shore. I realise I have not been in the open ocean – not a bay or harbour – since before I left for my Midlife Gap Year. Anywhere. I visited some on my ride home to Sydney from the Sunshine Coast in Queensland but for one reason or another didn’t swim at any of them. Admittedly I’m a bit intimidated by the surf – as a native of the American Midwest I came to ocean swimming late in life and being dependent on glasses to have clear vision – the power and mystery of rips and waves unsettle me. The last ocean beach I visited as part of this project was No. 31 Freshwater back in January 2014 – wow. Wet and sea-salty I take up a position on the beach in the sun and enjoy the warmth of the autumn sun – generally more pleasant than Sydney’s often bitingly hot summer sun. It’s already late afternoon and I don’t stay long – but it’s been a lovely day for it and I’m glad I got to Long Reef before the beach season ends. Long Reef was part of the homeland of the Dharug people, probably, before European invasion of Australia. The commonly used name, by Europeans, for the people who had been living in this area is Guringai, however, it now seems this is not what the people who lived here called themselves. Some rock engravings done by these people remain in the area. European settlement began in 1815 when William Cossar (a master shipbuilder) was granted some 500+ acres (200+ hectares) including Long Reef. By 1825 it was in the hands of James Jenkins, a former convict who had been transported in 1802 for stealing sheep. 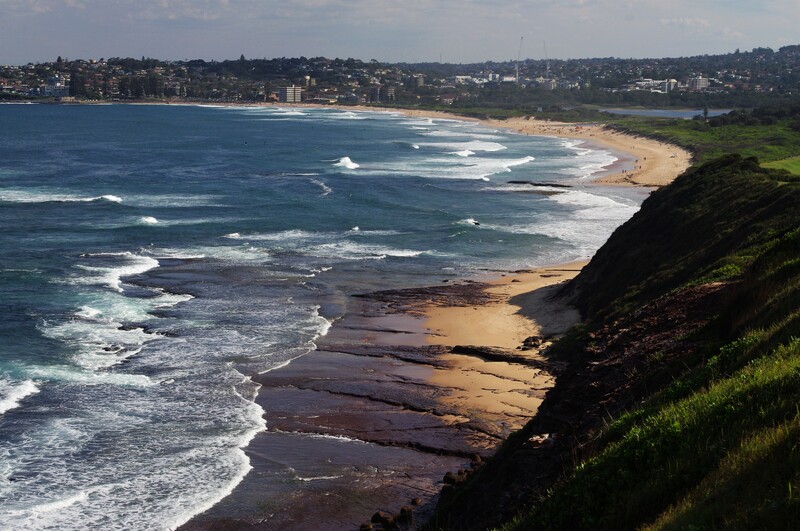 His eldest child, Elizabeth, had inherited land in North Narrabeen in 1821 and with the 1825 acquisition, the Jenkins family owned all of the foreshore form Mona Vale to Dee Why. At the extent of their holdings they had 1800 acres (728 hectares). 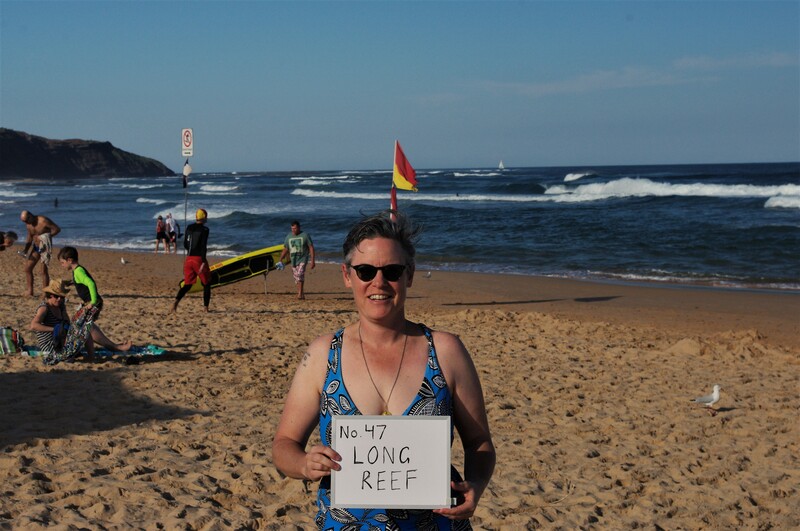 Long Reef is 24 kilometres (15 miles) from home. For census purposes it’s in Collaroy, which was, in 2011 home to 14,388 people of whom 50, or 0.4%, identified as Aboriginal or Torres Strait Islander. Conversely, 110 residents listed the United States as their country of birth. So there are more than twice as many Americans in Collaroy as there are Indigenous Australians. It’s in the Northern Beaches Council local government area, the state electorate of Wakehurst (Liberal – Brad Hazzard), and federal division of Mackellar (Liberal – Jason Falinski). *The next beach in the alphabetical list is actually Little Patonga – another Pittwater beach needing a boat. Four of those have now been set aside to be visited in one weekend out on the water, eventually: Gunyah (Brooklyn) No 35, Hallets No 37, Hungry No 39, and Little Patonga No 46.